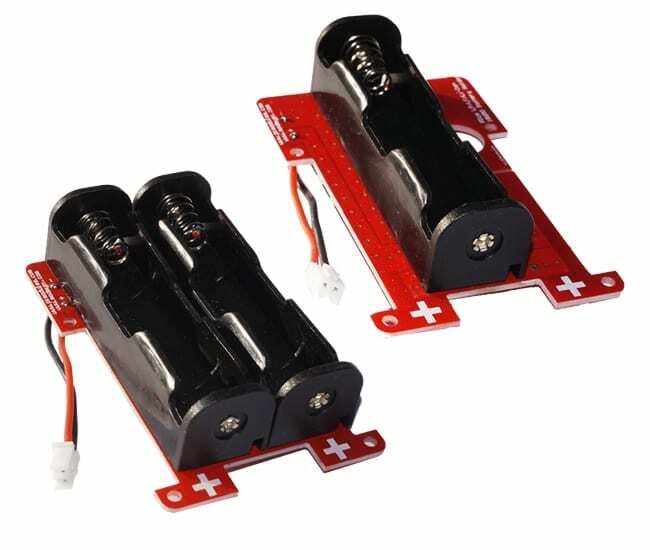 The PIco Single LP/LF/ Li-Ion 18650 Battery Holder is a add-on to the UPS PIco HV3.0A/B/B+ HATs Stack/ Top-End/ Plus/ Advanced that allows to use wide available 18650 LiPO, LiFEPO4 (123) and Li-Ion batteries. These batteries now can be used with the UPS PIco HV3.0A/B/B+ HATs Stack/ Top-End/ Plus/ Advanced without any restriction. Each PIco Single LP/LF/ Li-Ion 18650 Battery Holder is equipped with inverse battery insertion protection. It can be used with single 18650 Li-Ion batteries. It is strongly recommended to use PCB protected batteries due to security reasons. The maximum capacity available on the market is 3400 mAh. This product is NOT COMPATIBLE with Terminals Block PCB. The PIco Double Li-Ion 18650 Battery Holder is a add-on to the UPS PIco HV3.0A/B/B+ 450 HATs Stack/ Top-End/ Plus/ Advanced that allows to use wide available 18650 Li-Ion batteries. They are low cost due to use in the Electronic Cigarettes and offer a plenty of different capacities. These batteries now can be used with the UPS PIco HV3.0A/B/B+ 450 HATs Stack/ Top-End/ Plus/ Advanced without any restriction. Each PIco Double Li-Ion 18650 Battery Holder is equipped with inverse battery insertion protection. It can be used with single or double 18650 Li-Ion batteries. It is strongly recommended to use PCB protected batteries due to security reasons. If 2 pcs of 18650 Li-Ion batteries have been used, please notice that are connected in parallel so capacity of them is added. The maximum capacity available on the market is 3400 mAh x 2 = 7200 mAh. It is not allowed to use other types of batteries than Li-Ion, as on these chemistry batteries can be connected in parallel by user.